California oatgrass can be found at elevations between 500ft-7000ft growing in diverse climates, ranging from the cool, humid conditions near the coast to the hot, dry environments in inland valleys and foothill woodlands. Records from 48 climatic observation stations within or bordering its range indicate that California oatgrass has endured temperature extremes of -34° to 47° C (-30° to 116° F). In coastal areas climate is also affected by heavy wind in combination with abundant salt-spray. Fog is common in the summer. Climate is generally mild and moist to wet, with mean annual precipitation ranging from about 70 to 120 inches. California oatgrass occurs amongst native vegetation of the south Puget Sound prairie, and northern Puget lowland found on glacial outwash soils and represented by Idaho fescue-white-topped aster plant community type. 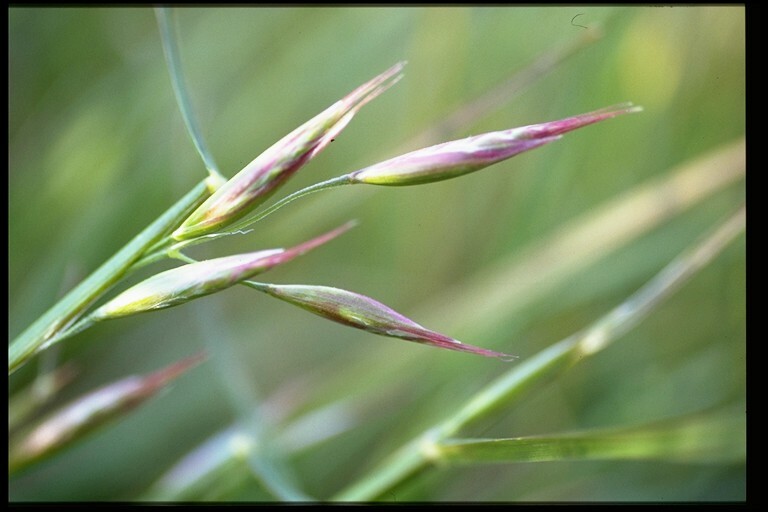 California oatgrass was likely a dominant bunchgrass of the original Canadian Garry oak ecosystem found on southeastern Vancouver Island and the Gulf Islands. This species is found growing in areas of grassland balds and prairie (shallow to excessively drained deep soils)5 Serpentine bedrock is present in some areas. An important dominant grass in California coastal prairies especially in drier areas Also found in Coastal sagebrush,California oakwoods, Fescue-oatgrass  and Garry Oak6 plant communities. Plant densely, using 1 foot centers in groups of 3 or more plants. Weed planting area before installation, follow-up with additional weeding and watering as needed. Dobrenz, A. K.;Beetle, A. 1966. Cleistogenes in Danthonia. Journal of Range Management 19:292-296 Referred to in Maslovat, 2002. Chappell, C. and Crawford, R. 1997. Native Vegetation of the South Puget Sound Prairie Landscape. As referenced in Dunn, P. Ewing K. eds. 1997. Ecology and Conservation of the South Puget Sound Prairie landscape, Nature Conservancy of Washington, Seattle. Hektner, M.M., and T.C. Foin 1977. Vegetation analysis of a northern Califorinia prairie: Sea Ranch, Sonoma County, California. Madrono 24:83-103 Referred to in Maslovat, 2002. Referred to in Maslovat, 2002. Campbell, C.S. ;Quinn, J. A.; Cheplick, G. P.;Bell, T.J. 1983. Cleistogamy in grasses. Annual Review of Ecological Systematics 14:411-441 Referred to in Maslovat, 2002. Keator 1990. Complete Garden Guide to the Native Shrubs of California, Chronicle Books, San Francisco, CA. Laude, H.M. 1949. Delayed germination of California oatgrass. Agronomy Journal 41:404-408. Referred to in Maslovat, 2002.